Between 6am and 2pm today only enjoy a free 795 calorie Denny’s Grand Slam breakfast. 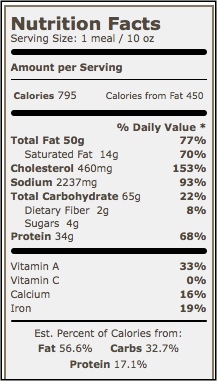 Featuring 50 grams of fat (that’s from two pancakes, two eggs, two strips of bacon, and two sausage). Amazingly even though there’s no such thing as a free lunch, this appears to be a completely free breakfast. Plan on arriving early because there are bound to be crowds. Dine-in only. Offer limited to Tuesday, 2/3/09, 6 am to 2 pm in all Denny’s restaurants in the United States*, Canada and Puerto Rico while supplies last. The only exception(s) are 350 Baker Blvd., Baker, CA and 740 S. Main St., Las Cruces, NM. Denny’s is providing a free Grand Slam breakfast (no strings attached) to anyone who visits between 6 a.m. and 2 p.m. Denny’s announced the promotion in an ad during the Super Bowl. 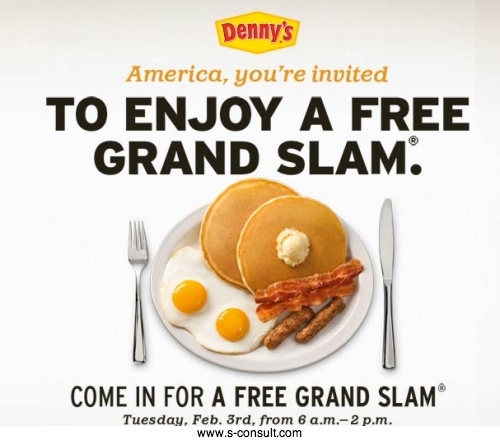 Denny’s expects to serve up to 2 million free Grand Slam breakfasts today. 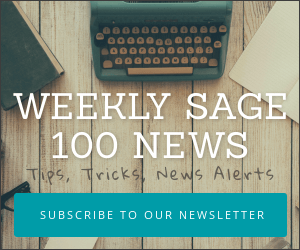 “This free offer is our way of re-acquainting America with Denny’s real breakfast and with the Denny’s brand,” says Nelson Marchioli, CEO, Denny’s. Everyone who take advantage of the Denny’s offer gets a coupon book with future deals, including offers for additional free menu items with purchases.